If you have seen the movie La La Land then you have seen Angel Flight Downtown LA. When Ryan Gosling & Emma Stone are running around having fun in Los Angeles they board Angels Flight for a quick ride. At the time of filming Angels Flight was closed but they reopened it for the scene. After filming work began to have it permanently reopened. Earlier this fall it became available for public use again. The top of Angels Flight is near a little food court with a peaceful seating area. On my second visit to Angels Flight, I was walking from the nearby OUE Skyspace and passed through this area. You will need to go up the stairs and to the left to board Angels Flight from this place. 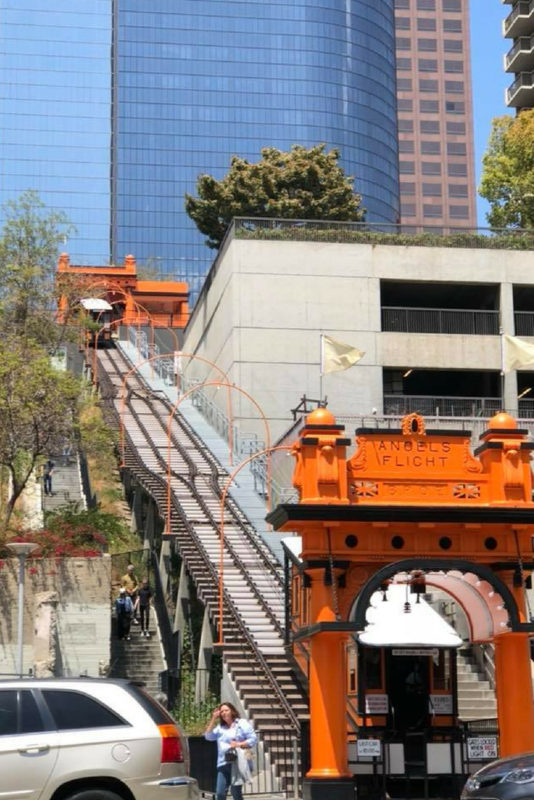 Angels Flight is an inclined railway which takes passengers up Bunker Hill in Downtown Los Angeles. There are two cars that can take guests up and down the hill. My friends and I came from Grand Central Market across the street & rode Angels Flight to the top of Bunker Hill. We paid for our one-way ride when we got to the top. It is open every day of the year from 6:45 am until 10 pm. The railcar is small with wooden benches. 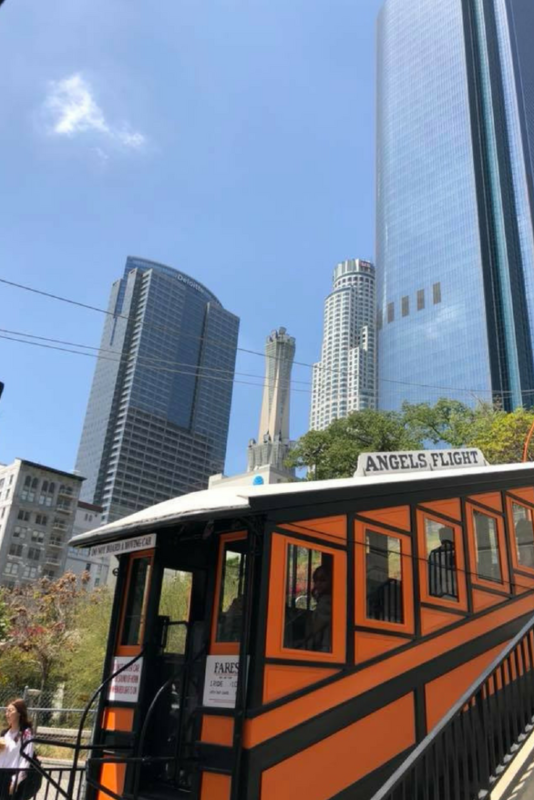 Your ride on Angels Flight will not last more than two minutes if the ride is even that long. It is brief but a fun experience. 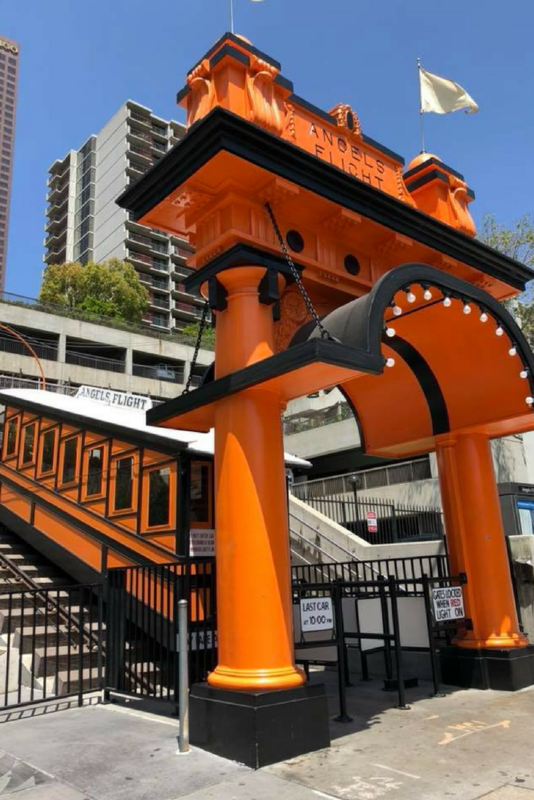 How Much Is A Ride On Angels Flight? A one-way ticket is $1. However, if you have a Metro card the one-way ticket is .50¢. If you do a roundtrip purchase you will get a souvenir ticket. I was bummed to learn about that after my roundtrip ride. 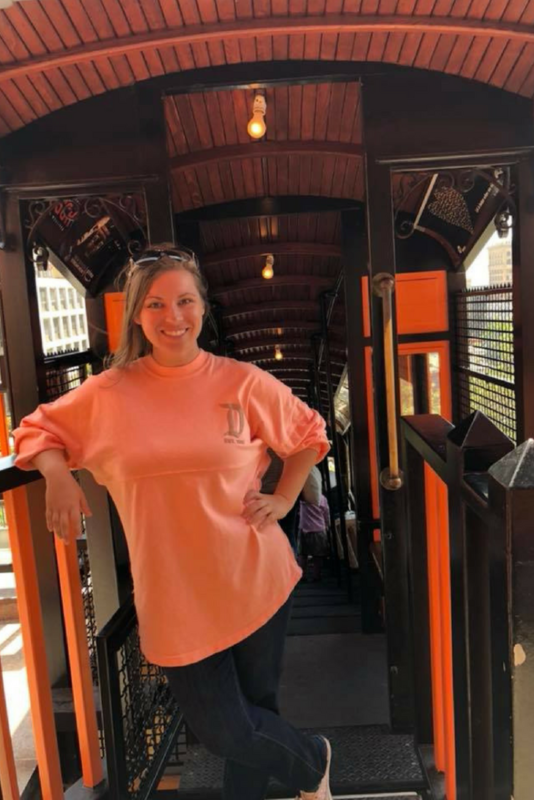 Is Angels Flight Worth Doing? Yes! Angel Flight Downtown LA is a cute thing to do when you’re already in the area doing other things. It isn’t worth a trip to downtown just to do this. 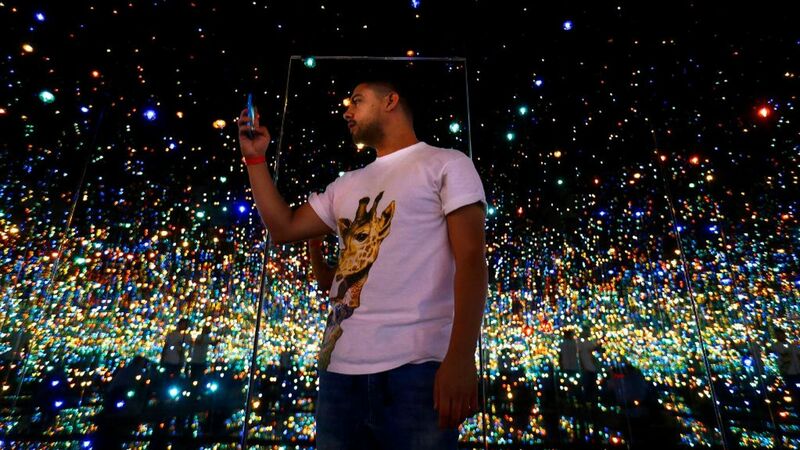 It is within walking distance of The Broad Museum. 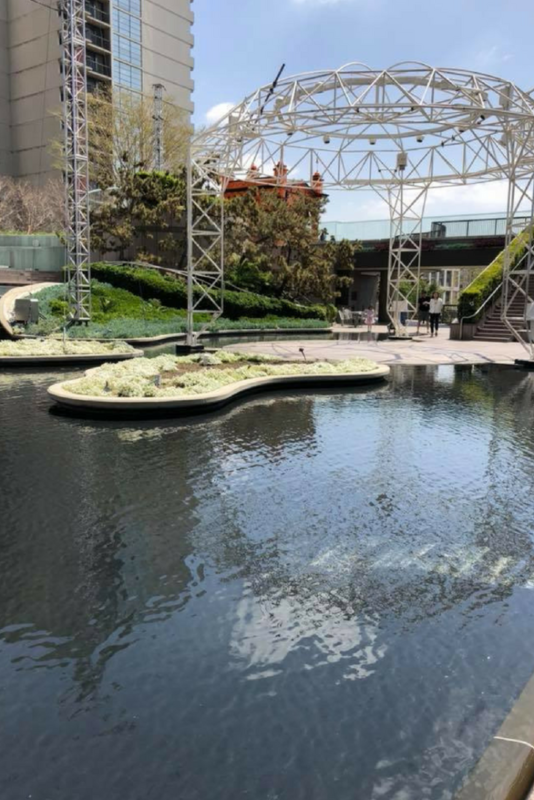 So if you get the free tickets to The Broad I would recommend walking to Angels Flight after and taking it down to Grand Central Market where you can grab a bite to eat. 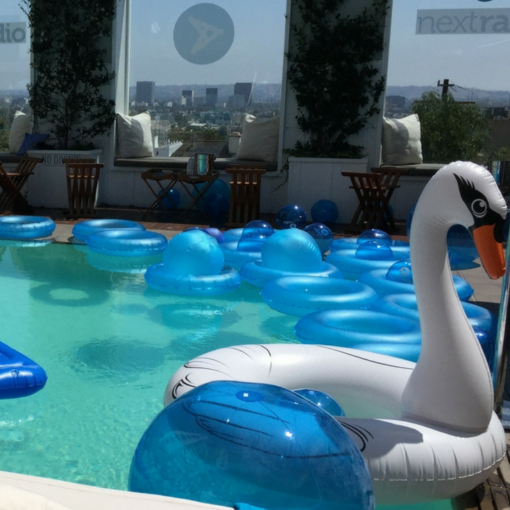 This would also be a fun activity to do either before or after catching a show at The Walt Disney Concert Hall. Grand Central Market which is across the street from Angels Flight was used in the movie. 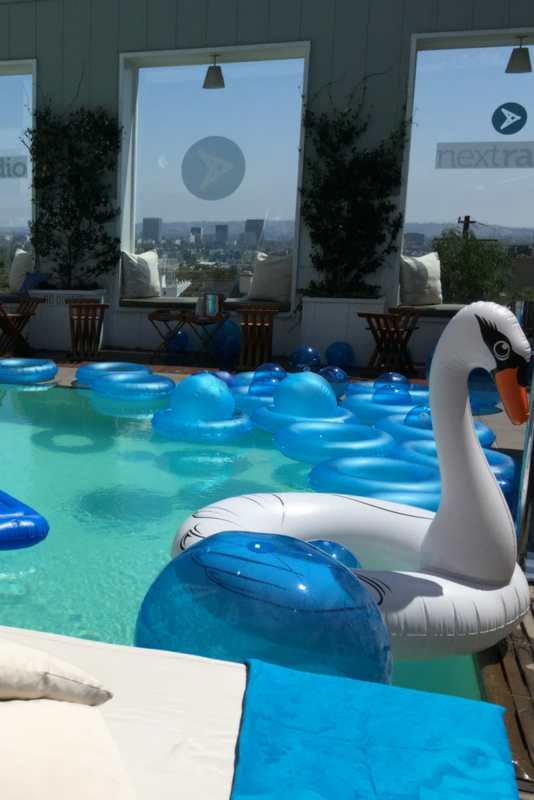 You can also visit The Griffith Observatory and The Smokehouse Restaurant in Burbank.